The Amazon Wish List has been around for a long time, but did you know there’s a way to add items from any website to your wish lists? 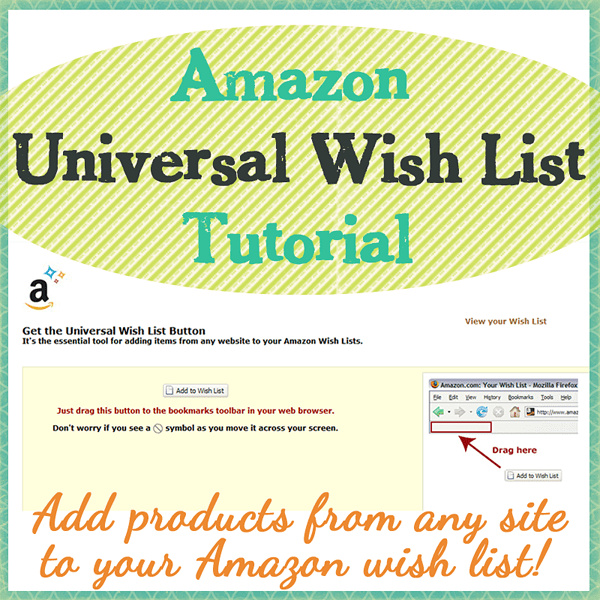 It’s called the Amazon Universal Wish List, and it’s super easy to use. All you have to do is drag the button from this Amazon page to your browser’s toolbar and then click that button whenever you’re on the page of a product you want to add. The product name and price will populate automatically, and you’ll have the opportunity to change the thumbnail and add a comment if you’d like. I created this screencast to walk you through it and show you an example. I recommend using full-screen mode (bottom right button after clicking play) so that it’s easier to see. I hope some of you will use the Amazon Universal Wish List to encourage your friends and family to shop handmade small businesses this Christmas! Hat tip to my friend Lauree from Dancing Dish & Decor for telling me about this nifty button! This post contains an affiliate link. Please see my disclosure for more information. Click through to get $6 off!